Part 1 Fundamentals of cold weather clothing comfort: Achieving comfort and thermoregulation in cold weather clothing. Part 2 Materials for cold weather clothing: Coated and laminated fabrics for cold weather apparel; Wool for cold weather clothing; Biomimetics and its impact on outdoor clothing. Part 3 Design considerations and ergonomics: Designing for ventilation; Adaptive systems for cold weather clothing. Part 4 Evaluation of cold weather apparel: Laboratory assessment of cold weather clothing; Evaluation of cold weather clothing using manikins; Human wear trials. Part 5 Applications: Protective clothing for cold workplace environments; Footwear for cold weather. Cold weather can be a potential hazard to human health, adversely affecting physiological functions, work performance and wellbeing. Designing suitable apparel for cold environments is therefore a complex task. Textiles for cold weather apparel reviews the principles, materials and requirements of cold weather apparel and will stimulate ideas for future innovation and improved end performance. The first part of the book covers the fundamental scientific issues and types of materials suitable for cold weather clothing. Topics include how to achieve comfort and thermoregulation in cold weather clothing as well as the use of coated and laminated fabrics. It also discusses design and ergonomic aspects such as designing for ventilation. Part two discusses ways of evaluating cold weather clothing, including standards and legislation governing cold weather clothing and laboratory assessments. Part three concludes with applications including cold weather apparel for the military and footwear for cold weather conditions. 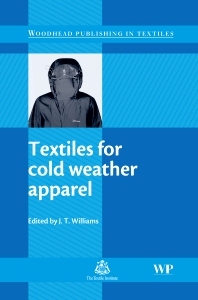 With an array of international contributors, this book is a valuable reference for producers, manufacturers, retailers and all those wishing to improve and understand developments in cold weather apparel. Dr John T. Williams is a Senior Lecturer in the Textiles Engineering and Materials (TEAM) group, De Montfort University, UK. He has published numerous scientific papers and several book chapters dealing with protective clothing. Dr Williams has also presented numerous academic lectures internationally. He is a member of many groups including Euratex and TechniTex.